Select from the categories below to find programs and resources for youth ages 13 to 25. Are you a youth or parent of a youth and are concerned about addiction / substance use? Find out about programs and resources available to support you. From health to housing find programs and resources available to help meet your basic needs. From resources for when you're feeling overwhelmed to programs supporting young parents completing their education view a list of family supports. View the list of programs and resources available to support LGBTQ2S+ youth. From a tech club to leadership and sports programs view the wide range of activities available for youth in Abbotsford. From bullying and online safety to sexual exploitation prevention and child protection services find out about programs and resources on these tougher but important topics. 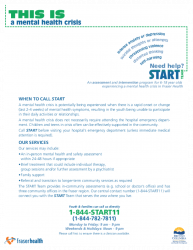 If you need help with a teen having a mental health crisis connect with the START team. START stands for Short Term, Assessment, Response, Treatment - they provide assessment and intervention services for 6 to 18 years olds.